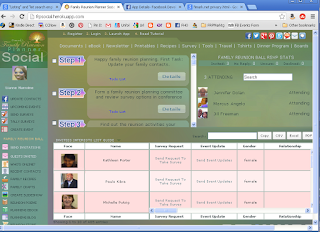 The Family Reunion Planner Social web app officially launched today, May 27th 2013. Choose from five reunion themes and associated printables and custom designed t-shirts. The social enabled family reunion planner includes several apps on one interface for updating your facebook contacts and activity surveys. Surveys are automatically tallied when users like preferred themes and activities. Connect to the planning committee via chat, video conference or skype while sharing and editing the web apps reunion planning and department worksheets in real time. Send invitations instantly. Keep track of RSVP statuses. Select poetry recital candidates using provided book interest data..
Download the complete family reunion planner spreadsheet. The spreadsheet is a stand alone family reunion planner. Import guestlist data into the spreadsheet and save time on data entry. Find the ideal location and venue for your event. Plan your itinerary and Luncheon/Dinner program. Plan and organize the layout of your reception hall using the Reception Hall Floor Planner. Choose from over 300 recipes ideal for your potluck reunion picnic or banquet dinner. The skies the limit with the new Family Reunion Planner Social web app. Planning a family reunion? 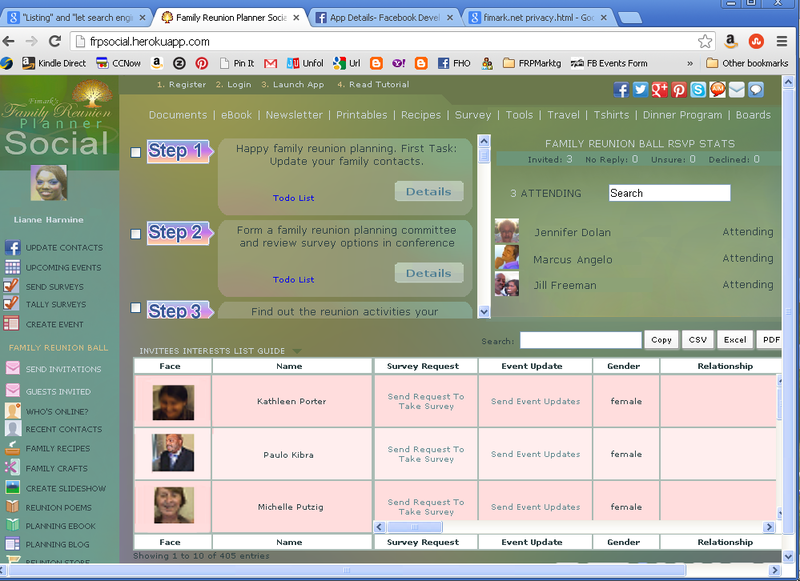 Don't have Fimark's Family Reunion Planner Social web app yet? Get it at this summers discount special. List Price $49. Now $39 for a limited time. You save $10 dollars. No coupon code needed. For more information about the family reunion planning app click on the link found on this blog page or go to profiles. The Family Reunion Planner eBook is Out!